hotel room there. Resident Astronomer Peggy and I made reservations last year so we are set. I got an email from Friend for 50+ Years, Gary, that the hotel rooms in the state are really full already and that if he goes to Casper, he will be in his travel trailer. That would be great to see him there too, since my other physicist wannabe Looking for Gravity Waves, Dr. Gary, should also be there at the same time. Wow, two Gary's or Gary squared, I guess. Hope it all works out. The other calendar item for September is the AIAA Space 2016 Conference in Long Beach, CA. Space 2015 was held last year in Pasadena and should be another great even this yeart. One of the special presentations will review the success and planned operation of Juno spacecraft, which just went into orbit around Jupiter on July 4. That is just one of the hundreds of presentations and exhibits for our enjoyment. See you all there. In the mail this week, Legacy Coder, Now Studying Physics Fulltime, Larry, sent in an image of Saturn. This was his first Saturn image. See Below. It looks good Larry, thank you! This recently discovered galaxy, Dragonfly 44, has roughly the same mass as the Milky Way, but only 1% of the visible stars as the Milky Way. Dark matter effects are being observed and are key to understanding the evolution of galaxies. Gene goes on to ask, "what will be next, a galaxy with no stars"? Yes, I suppose so. Maybe mostly dark matter or maybe even dark stars, made of dark matter, and they would emit no visible light. Who knows? Thanks Gene. Finally, the star party. A good time was had by all and OCA Star Party Coordinator, Steve, gave us the laser pointer review of the night sky. Then Resident Astronomer Peggy retired to her lounge chair with binoculars in hand. Joining her with binoculars was Left his Big Celestron Home Tonight, Dave, who appreciated the different views with binoculars. Good to see you, Dave. Also there was Amateur and Expert Accordion Player, Mike, who also left his scope at home, but at least he brought wife, Betsy, Good to see you guys, Mike and Betsy! Everyone had a chance to see the conjunction of Jupiter and Venus, just as they were sliding below the horizon. I pushed the scope to that location and could see both planets in the same field of view. Then I continued with the alignment process and this time I did not wait for Polaris to be visible because my recent learned lesson is that the initial polar alignment is good enough and later as bright stars appear, the final polar alignment could be done with any bright star, not having to wait for dim Polaris to show up. Once aligned, I slewed the scope back to where Polaris should be, and yes, there it was, centered in the eyepiece. 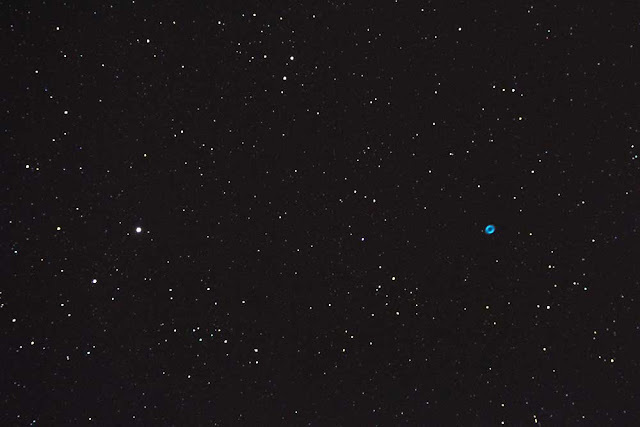 I then showed Polaris and its dim companion star to excited visitors. 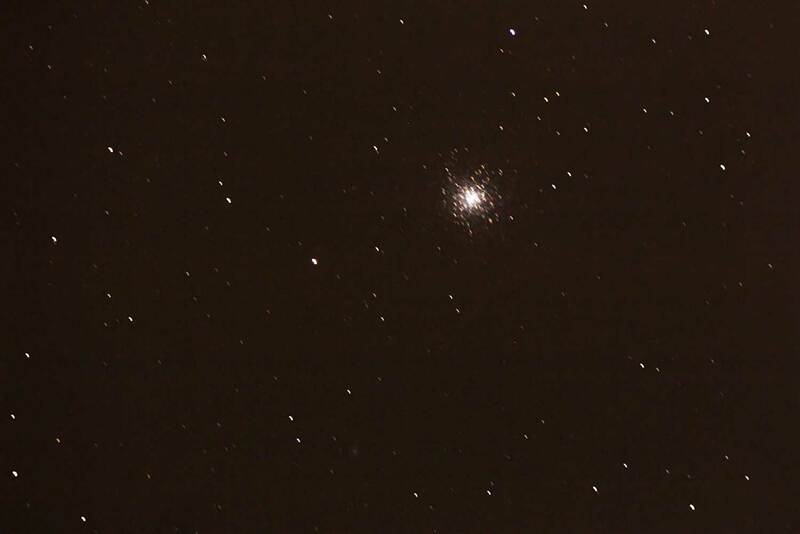 The first deep sky object I took a look at was M13. See below. This 60 second exposure shows some star trailing so after looking at a few other objects, I performed the 2nd part of polar alignment. The 2nd part is where you slew the scope to a bright star and then carefully reposition the scope by manually moving the adjustment screws, if you are lucky, and/or physically moving the whole tripod setup, if you are unlucky, so that the position predicted by the scope algorithms exactly matches what shows up in the eyepiece. My initial alignment error readout was 1 degree, 37 minutes off in Azimuth and after the alignment process, the error was 0 degree, 9 minutes. Helping out and observing in this endeavor, were Also Left their Scope at Home, George and Pat. Thanks and good to see you amateurs again. 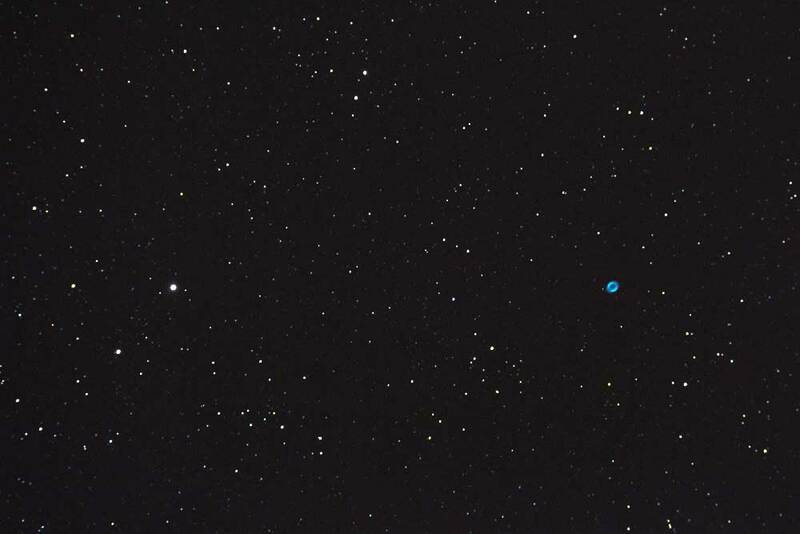 Next up for the evening was M57, the Ring Nebula, See, the 30 second exposure below. He does a very good job of going through the details. 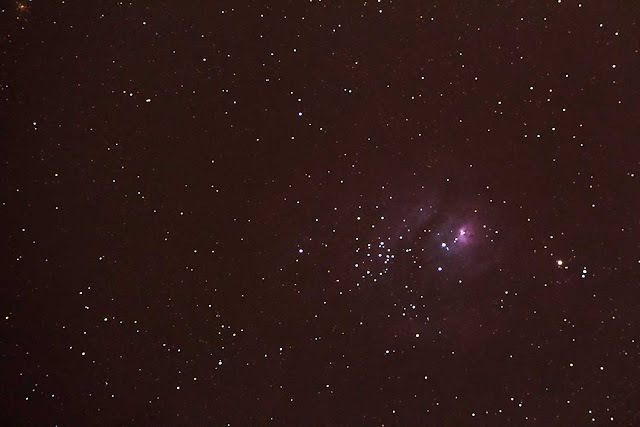 Finally, as the evening was coming to a close, I tried to get M8, The Lagoon Nebula, which really requires dark skies, but it was still visible at Black Star. Check out the 30 second, ISO 1600, exposure here. Now, I had some help and good advice on capturing this image from Civil Civil Engineer, Marcello, and Mad about Mars, Eric. Now, Eric always displays some great video images of Mars. Those standing around thought we could definitely see the polar ice caps. Me too!, but then some folks from years back thought they could see canals too. But, I do think we saw ice caps. Thanks Eric! They both have been successful in getting M8 in dark skies like at Anza and Ortega highway sites. Its hard to get some of the nebulosity without dark skies. One thing they recommended was to increase the ISO from my standard 200, to ISO 1600+. Now, I normally resist going to higher ISO because after all it doesn't really help improve the signal to noise ratio, which is key for my ongoing light curve studies, but at least with higher ISO, you can see if you are getting close to capturing the target without waiting for very long exposures. Good point. Thanks guys! So, we packed up and drove back to the observatory. Darn, I forgot to attempt getting Neptune in the camera. Oh, well, save that for next time. Perhaps, I should actually write down the goals for the night observing and be sure to check them off before calling it a night. Now, I almost forgot about Astronomer Assistant Ruby's big discovery. Well, it turns out that in the morning after Black Star, Resident Astronomer Peggy was out for a walk on the observatory grounds with Ruby, when Ruby noticed something strange sneaking out from under the garage door. What was it? Well, when I was summoned out to take a look, guess what I found? 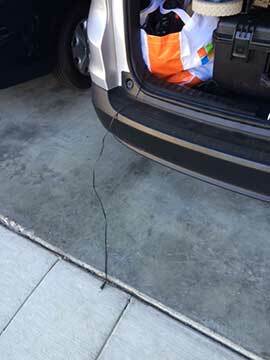 Yes, the photo below shows a cable sneaking out of the telescope delivery vehicle and just barely lying outside of the garage door. It turns out to be the telescope mount power cable that must of jumped out of the bag of telescope batteries and was dragged along on our drive home. I looked at the cable end and surprisingly, there was not much damage. I guess the cable mostly flew along in the air and only hit the street when we rolled up to a stop sign. Not much damage at all. Lesson learned from this? When you leave a dark sky observing site and don't want your vehicle lights on so as not to disturb other observers, be sure to check that all you stuff is securely inside and don't leave anything behind or in this case trailing behind. The other lesson is don't wait for your assistants to notice something that you should have caught yourself. But, thanks Ruby! Ruby says "You are welcome!" Enjoyed the blog! Amazing photoshoot. Can't get over those pictures. Thank you for sharing such a beautiful post with us. I appreciate your effort a lot. A sky looks very beautiful with stars and the moon. Just like in this picture the galaxy stars are looking so charming.